A line set selects, among the lines (edges) detected by Freestyle, which ones will be rendered using its attached line style, through various methods. 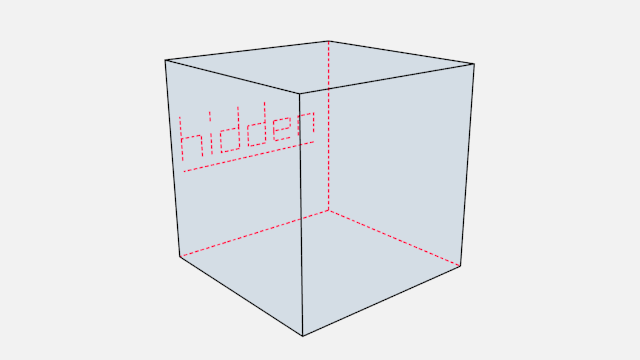 There are three choices for selecting edges by visibility. 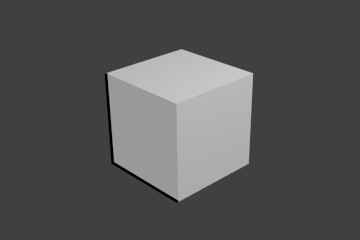 Only lines occluded by no surfaces are rendered. Lines occluded by at least one surface are rendered. QI stands for Quantitative Invisibility. Lines occluded by a number of surfaces in the given range are rendered. 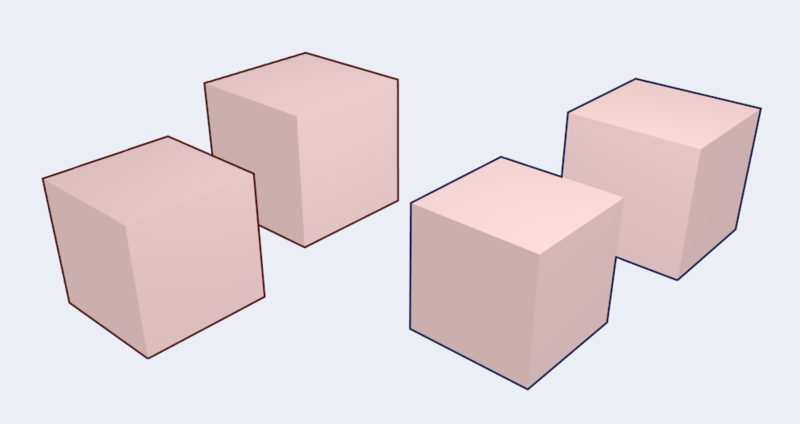 Edge types are basic algorithms for the selection of lines from geometry. 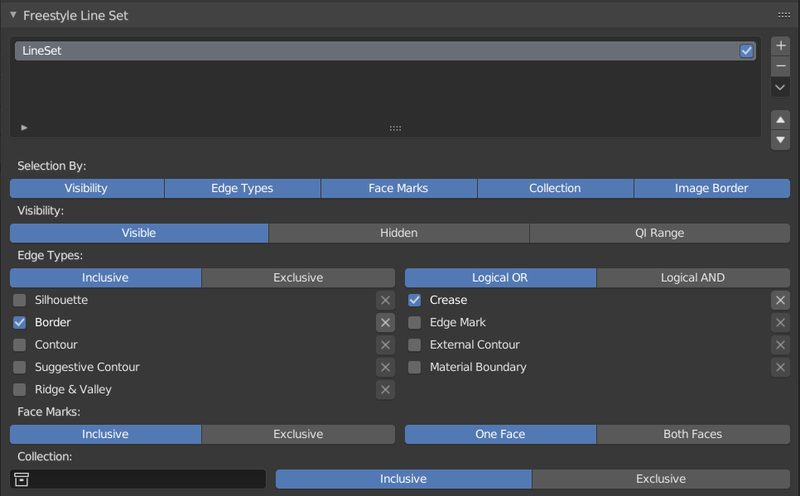 When using the parameter editor you have to choose at least one edge type in order to get a render output, but several edge types can be combined in one line set. Edge types can also be excluded from calculation by pressing the X next to them. 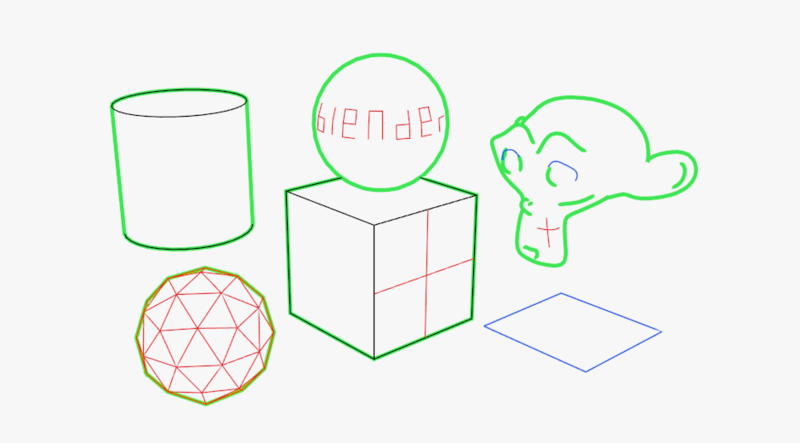 Draws silhouettes around your closed objects; it is often good for organic objects (like Suzanne & Sphere), and bad for sharp edges, like a box. 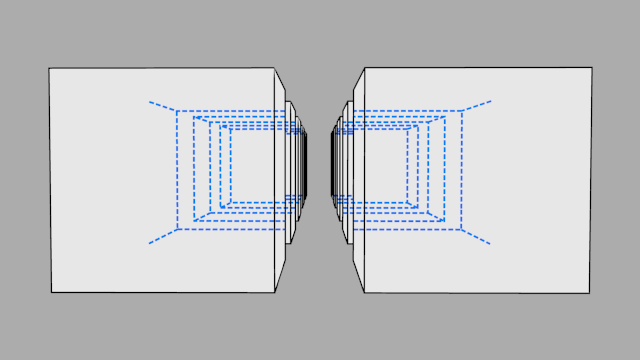 It cannot render open mesh objects like open cylinders and flat planes. The output is affected by the Kr Derivative Epsilon view map setting. Renders marked edges. See Edge Marks for details. Draws the outer edges and inner open border. 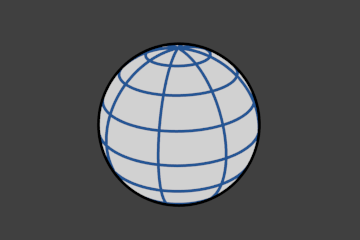 Draws the contour lines, but only on the outer edges. Draws lines where two materials meet on the same object. 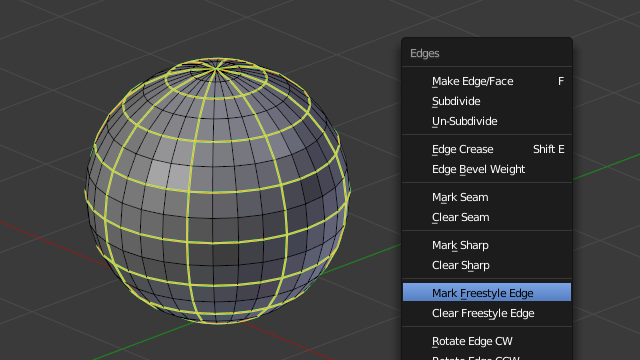 In Edit Mode you can mark «Freestyle Edges» in the same manner you can mark «Seams» for UV unwrapping or «Sharp» for edge split. 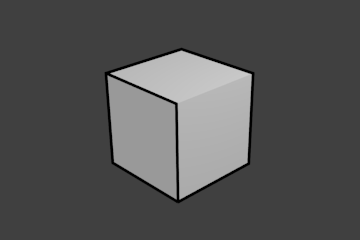 These marked edges are available to render when you select Edge Mark. Select the mesh object and enter Edit Mode. Select the edges you want to be marked. Press Ctrl-E and select Mark Freestyle Edge. 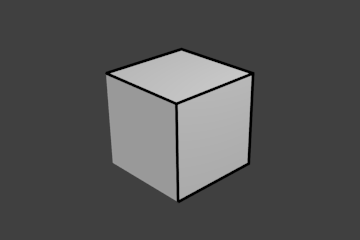 Edge marks are useful when you want to draw lines along particular mesh edges. The examples below explain the use of edge marks. The edge marks are highlighted in green. With edge marks enabled, the previously-marked lines are always rendered. You can see the black contour lines and the blue lines that are made with edge marks. What are edge marks good for? When you need to render marks on an almost-flat plane, when other edge types cannot detect any line. When you want full control of edge rendering. Often used for edges of squarish shapes. What are edge marks not good for? 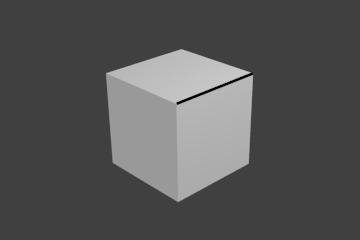 Select a mesh object and enter Edit Mode. Select the faces you want to be marked. Press Ctrl-F and select Mark Freestyle Face. Face marks are useful for removing lines from certain areas of a mesh. 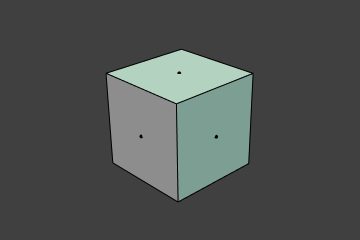 In this example, two faces of the default cube are marked like the image on the left. On the right is a render without face marks activated. 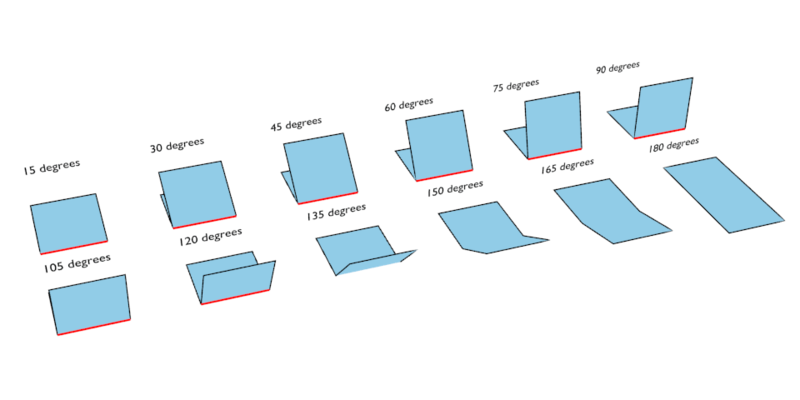 Whether to include or exclude edges matching defined face mark conditions from the line set. (De)select all edges which have one or both neighbor faces marked. (De)select all edges which have both of their neighbor faces marked. The image below shows the resulting combinations. You can include or exclude objects for line calculation, based on their belonging to a group. The name of the object group to use. Whether to include or exclude lines from those objects in this line set. If enabled, Freestyle only takes geometry within the image border into consideration for line calculation. This reduces render times but increases continuity problems when geometry is moved out of and into camera view.